In the previous post, an Evidence-based Pedagogic Framework for developing SDL was established (he says hopefully). In this third post, the methodology for the systematic infusion and facilitation of metacognitive strategies is outlined and illustrated. prolonged training to guarantee the smooth and maintained application of metacognitive activity. In conducting a curriculum review, first identify the important learning outcomes that require metacognitive and cognitive activity (e.g., critical thinking skills), and when and where they are taught in the curriculum. You may need to re-write certain learning outcomes to make these ‘thinking skills’ explicit. This provides the guide for introducing specific strategies that will aid students in developing such skills. Invariably, metacognition runs throughout the learning process and needs to be taught early in the program. However such competence requires students to have a clear understanding of what this entails in terms of the strategies and skills involved and how they work, in order to use them effectively as tools for learning. There is often an assumption that thinking is simply common sense. Well, even if it is, and I don’t think it is, it’s not that common. In the first post, I made reference to the importance of Good Thinking as a key underpinning competence for SDL. While Metacognition is an essential part of good thinking, there is also the rest of thinking. If metacognition can be referred to as ‘thinking about thinking’, then what is thinking? Of significance, then, according to Willingham, “Memory is the residue of thought” (p.47). When folk, even some teachers, talk about getting students to think and not memorize they fail to understand how the learning process really works. What is even more significant is that teachers must teach such important knowledge about learning, so that students also possess these understandings, which are so important for developing SDL. In terms of how we think this means that while, for example, psychologists may solve problems in some qualitatively differently ways from engineers, both at the individual and collective level, there is much similarity in the types of cognitive activity involved. For example, they will need to analyse situations (e.g., cases), make comparison and contrast with similar cases, build up inferences and interpretations from ongoing perceptions and data accumulation, generate possible solutions and decide action based on chosen criteria. Around this swirl of cognitive activity, there will be an overall monitoring of what is going on, typically referred to as metacognition. 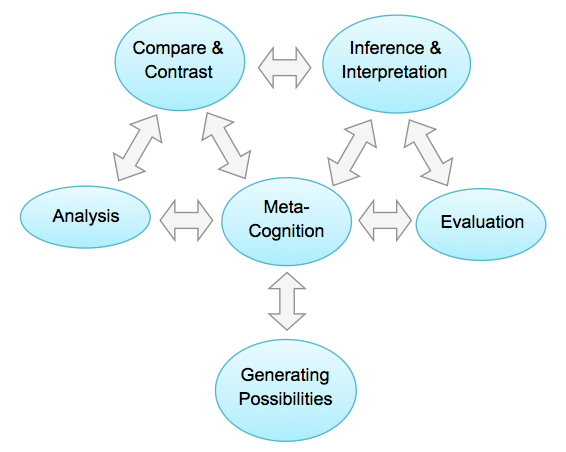 The summary model is depicted in Figure 1.1: Sale (2015) Model of Types of Thinking, and the typical cognitive heuristics involved are outlined in Table 1.1: Cognitive Heuristics of Types of Thinking. Note that the cognitive heuristics for each type of thinking are the essential framing questions to be negotiated in making sense of information and building understanding. In this model, analysis, compare & contrast, inference & interpretation and evaluation are typically employed during critical thinking; whereas generating possibilities, as the term implies, is predominantly employed in creative thinking. 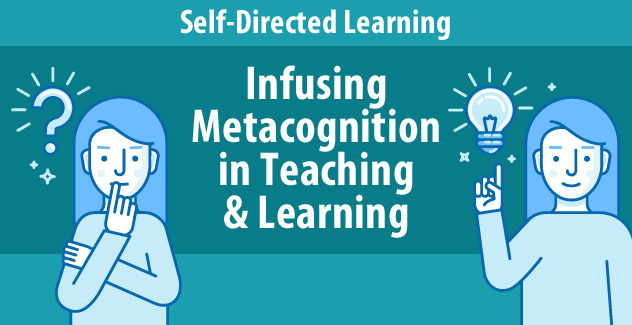 Metacognition refers to the awareness of and ability to monitor and control one’s cognitive and affective processes in-order to enhance thinking and learning (as you know)! Schraw et al (2006) urge educators to provide explicit instruction in metacognitive and cognitive strategies. They emphasize that such strategy training needs to emphasize how to use strategies, when to use them, and why they are beneficial. The most significant gains in student achievement result when students are taught the use of metacognitive strategies in explicit ways. Providing repeated opportunities for using the strategies in spaced (guided and independent) practice formats. In the process of helping students to build sufficient understanding of what constitutes good thinking and how to develop this capability, some key instructional strategies are particularly useful. For example, making thinking visible (both student thinking and teacher thinking) is essential, but this must be done consistently and sufficiently for it to become cemented in long term memory and established as an everyday practice when good thinking is required. In order to facilitate this effectively, the key terminology relating to the various heuristics of the types of thinking need to become part of the language of learning (to consolidate a language of thinking). 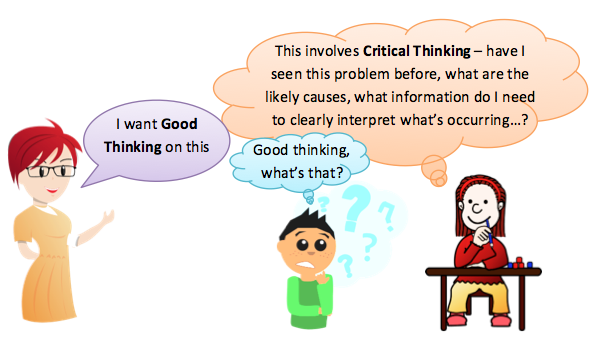 For example, I often hear teachers, who I assume are seeking to encourage student thinking, use terms like “What are your comments on this” or “Let’s discuss this”—even “I want good thinking on this.” This latter example assumes that students actually have a mental model (schemata) of what constitutes thinking. However, in reality this may vary widely (e.g., Fig. 1.2: Mental Models of Thinking). If they have no prior useful mental model, then they are either totally blank or in the process of just commenting, which typically results in statements like, “It’s ok”, or “I don’t like it much”, which has little underpinning thoughtful analytical or evaluative base to it. 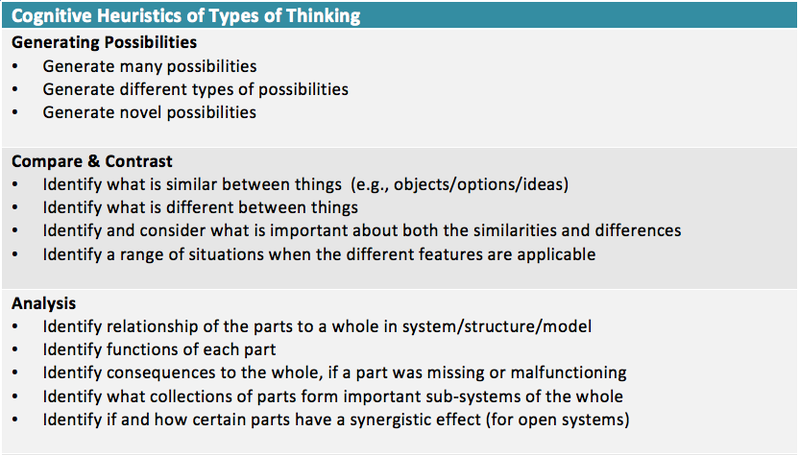 In contrast, when students understand the different types of thinking, and the cognitive heuristics involved, they can respond thoughtfully (no pun intended) to their teacher’s systematic use of language to specifically cue these types of thinking. This provides the essential modeling and practice to develop competence over time. For example, a possible teacher question in a situation of comparing two solutions to a problem situation might be something like, “Comment on these two proposed solutions.” However, to provide the essential structuring to cue and develop the desired thinking process, a better questioning approach would involve something along the lines of, “Let’s compare and contrast these two solutions... identify what is similar and different in each... what is significant about the differences in the solutions… what’s important about these differences… how do these differences impact the problem situation we are trying to address?" 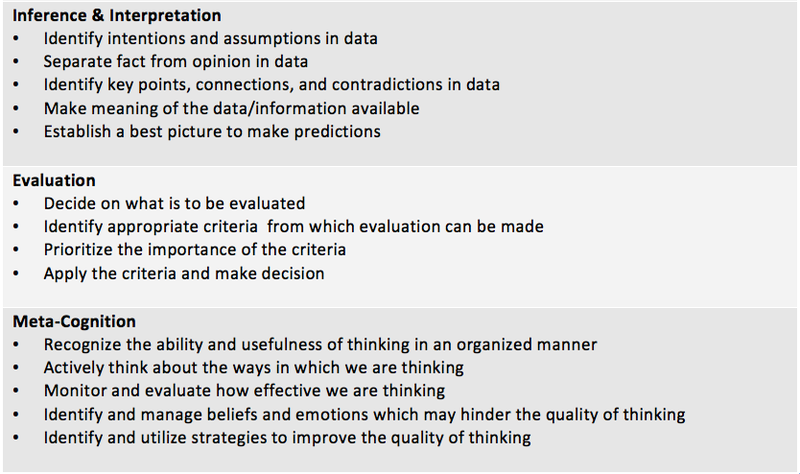 Through the use of appropriate cuing questions, in which the types of thinking are naturally infused into the content of the topic, students will quickly become familiar with the ‘language of thinking.’ For example, when asked to evaluate options, whatever the subject context, they will have already internalized that this requires the deriving of relevant criteria to be used in evaluation, the likely prioritizing of these criteria in terms of relative importance in making the decision, and finally to apply the criteria, based on the available information, to the option or range of options. Questions are the primary way we learn virtually everything. This entails getting students to reflect on and document the quality of their thinking and other aspects of self-regulation (e.g., emotions, beliefs), identifying challenges faced in their learning, how they tackled these, the strategies used, and their effectiveness (or otherwise). I know this has been a ‘meaty’ post, so you will have displayed good volition—even motivation—on completion. In the next post, I will outline key motivational strategies for promoting SDL. As pointed out in the first post, without motivation, there may be little by way of purposeful self-direction. Ambrose, S.A., et al. (2010) How Learning Works: 7 Research-Based Principles for Smart Teaching. Jossey-Bass, San Francisco. Marton, F., (1981) ‘Phenomenography – Describing conceptions of the world around us’, in Instructional science 10, 1981, 177-200. Elsevier Scientific Publishing Company, Amsterdam. Paul, R. W., (1993) Critical Thinking: Foundation for Critical Thinking, Santa Rosa, CA. Paul, R., Niewoehner, R., Elder, L., (2006) The Thinker’s Guide to Engineering Reasoning. Foundation for Critical Thinking, Tomales, CA. Ritchhart, R., Church, M., & Morrison, K., (2011) Making Thinking Visible. Jossey-Bass, San Francisco. Robbins, A., (2001), Unlimited Power. Pocket books, London. Sheppard, S. D., et al., (2009), Educating Engineers: Designing for the Future of the Field. San Francisco: Jossey-Bass. Wagner, T., (2010) The Global Achievement Gap. Basic Books, New York. Willingham, D. T., (2009) Why Don't Students Like School: A Cognitive Scientist Answers Questions About How the Mind Works and What It Means for the Classroom. Jossey-Bass, San Francisco.